Most Tuesday mornings at 10am a small group meet for fellowship and prayers at Christ Church. Christ Church welcomes visitors The church is open from approximately 10am to 5pm (or dusk in winter) daily. If you have information about the village or the church and would like to share it, please leave contact details in the visitors' book. From outside, Christ Church appears neat and well proportioned. The walls are of local sandstone with Bath stone corners and arches, and the roof with its single-bell tower has plain tiles. Step inside, however, and you are soon aware that this is not just another Victorian church. It is spacious and understated and has none of the clutter and over-decoration typical of its period. 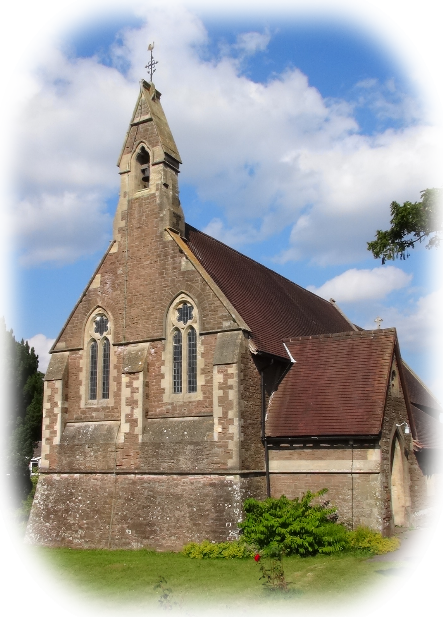 It is in fact the first complete church to be designed by George Frederick Bodley (1827-1907), at that time a pupil of Sir George Gilbert Scott. Bodley, who went on to become one of our leading ecclesiastical architects, did not favour Victorian interpretations of classical styles but looked back five centuries to the simplicity of fourteenth-century English Gothic. This was an inspiration to the movement which later became famous as Arts and Crafts, although that name did not appear until the 1880s, thirty or so years after Christ Church was built. Bodley did not look upon himself as an Arts and Crafts exponent and neither did his contemporaries consider him as such, even though he was a friend and sometime business partner of William Morris, the radical Socialist, designer, painter and writer, and cooperated with him in the planning and production of church furnishings, decoration and stained glass. The east window, a typical mid-Victorian style, was probably by Thomas Baillie (1815-83). The possible date of manufacture and fitting was @1856, which suggests that it could have been commissioned specially for Christ Church in time for the opening. The World War I memorial inside the church is a typical Arts and Crafts piece, with the simplicity of the sheltering tree and the freehand lettering. The painted screen behind the altar, with its panels of angels, is considered to be a worthy Pre-Raphaelite work. It can be attributed to Charles Lane of Amberley, Sussex, but it is not clear whether he painted the whole screen or just the centre panel. The wooden framework, already in position, was reduced in height by about one foot to accommodate the paintings which themselves cost fifteen pounds overall. The faculty (diocesan permission) for this work was granted on 31 December 1897 and we are told that the money was already in hand. The screen, dated 1898, commemorates Mrs Catherine Marriott, Lady of the Manor of Goodrich and resident at Sellarsbrook, who endowed the church by giving the land and meeting the overall cost of £1500. It was built between 1854 and 1856 by Roberts, a Monmouth firm. Mrs Marriott paid for the adjacent school and master's house which opened in 1875. The organ was built by Arthur Caldwell (1895-1924) of St Helens, Lancashire (not by Messrs Ainscough as the plate suggests) and was installed first in St Luke's Church, Eccleston, Lancashire. 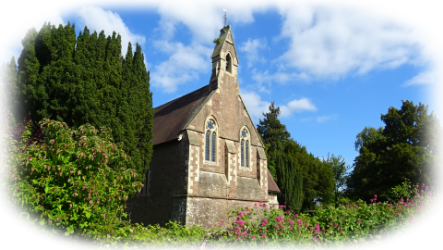 It came to Llangrove in 1970, bought for £525 from Childwall Methodist church in Liverpool, with the interesting suggestion - confirmed by the National Pipe Organ Register - of a connection with Sir Thomas Beecham's family firm. It is believed that the instrument stood in the reception area of Beecham's factory in St Helens; it was loaned to the town hall there so that Sunday services could continue after the parish church burned down. 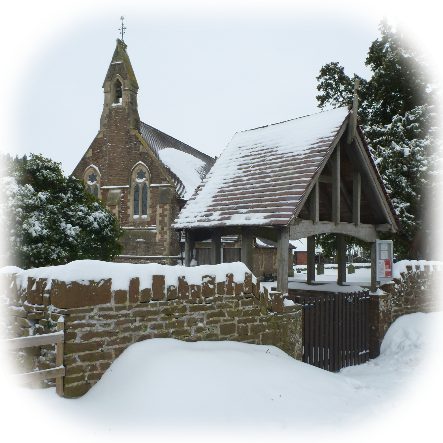 It is still in regular use in Christ Church, Llangrove.